The double X formation of the Audrey Trestle Extension Dining Table creates a state of dynamic tension giving the design a rigid base that provides diners with plenty of unobstructed leg room. Audrey Tables are available in a number of sizes and configurations to meet the needs of almost any dining space. Extension tables incorporate precision bearing glides and a self-storing butterfly leaf for effortless action. The Audrey Dining Room is crafted in solid cherry and Made to Order in several finishes. 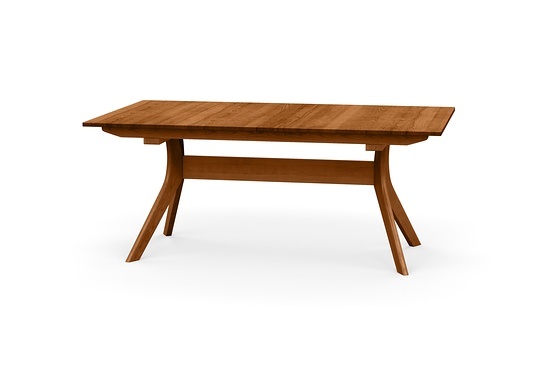 Audrey Tables are also crafted in solid American black walnut. Walnut dining items are finished with a low sheen (10 sheen) top coat. The finish is GREENGUARD Certified for low chemical emissions. All tables are made to order and pricing shown is for the 38″ x 60/84″ extension table.